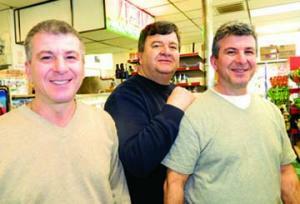 Ashmont Market: Peter, Harry, and John Georgoulopolous have worked side by side since 1984. 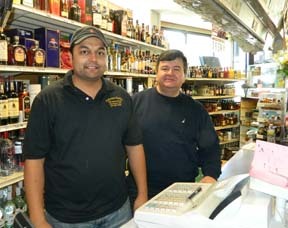 The brothers sold the business to a new family on Monday, but plan to work there in the near term to help with the transition. Photo by Bill ForryIt’s less than 24 hours after “the deal” went down and already changes are afoot inside Ashmont Market. Every few minutes, another two-wheeler spins through the front doors piled high with cardboard boxes destined for the nearby grocery aisles. The new management is stocking up and taking charge at the busy corner of Ashmont and Adams. The Georgoulopolous brothers— Harry, Peter and John— have been fixtures here for 28 years. On Monday, they sold the business and building to the Patel clan, an Indian-American family with a burgeoning empire of neighborhood stores that includes two other Dot stalwarts, Cappy’s (the old Patty’s Pantry on Dot Ave.) and the New Store on the Block in the Polish Triangle. The Patels are pros in the corner store world and there’s every reason to believe they’ll make Ashmont Market just as successful as their Greek predecessors did. But the Georgoulopolouses don’t look so sure about that. All three brothers wore faces hung with varying degrees of chagrin and worry on Tuesday as they worked alongside the new guys. Not that they wish them any ill will. In fact, the Georgoulopolous brothers are nothing if not sympathetic. It’s tough to be the new owners in a place as sacred and as treasured as the neighborhood grocery— especially when it’s been under the same owners for almost three decades. For the next month or so, the brothers will help the Patel family with the transition. They’ll make the introductions, show them how they did things. Then, they’ll move on to new adventures. The eldest brother, Harry, 55, is the most ambitious. He’s already invested in a manufacturing business with a partner in Alabama. He plans to move down there later this year and mass-produce baklava, the Greek pastry. Of the three brothers, Harry seems the most eager to be moving on. Twins Peter and John don’t look as relaxed. John, who smiles good-naturedly most of the time, admits that he’s had some pangs of doubt. Peter, who has spent most of his time at the front counter dealing with the regulars, looks a bit lost. He’s been getting an earful for weeks now from customers worried about the impending change-over. Not that their mother, Vasiliki, likes it, either. The Dorchester store has been the glue that has kept her family together since 1984. It paid for their first house in Cambridge— where the family settled after immigrating here in 1975— and then the subsequent homes for the brothers and their families in Norwood. Over the years, the Georgoulopolous family continually made improvements to Ashmont Market, which dates back to at least the 1940s. They expanded the footprint into a neighboring photo studio, making room for more groceries and Irish goods to satisfy their strong base of immigrants from across the pond. And they relocated the meat counter and deli to the addition, adding extra cooler space for cold beer, another popular move among the locals. John learned how to be a butcher here on the fly from an old Jewish man named Sydney Tobias, who was “here long before us,” he recalls. The old butcher taught him the tricks of the trade and John says he “picked up everything.” One day, they got a call from Sydney’s wife that he wouldn’t make it in that day because he had died overnight. John has manned the counter ever since, using the same vendors and preparing the roasts and cuts in the fine tradition he learned from his predecessor. The meat counter is one of the reasons that the Patel family— and several other suitors— came knocking on Ashmont Market’s door in recent years. Each buyout offer was met with a, ‘Sorry, not for sale,’ until last year when Peter — on behalf of his brothers— agreed to hear the Patels out. Jay Patel, who’ll be running the store with his cousin Tap, is a first-generation Indian-American who learned the business from his uncle. Jay says that his family was drawn to this store because of its location and the strong base of customers, many of whom walk to the store daily for lottery, liquor, but mostly, groceries. “It’s got the whole package, especially with the deli. You don’t see that in too many places anymore,” says Patel, who’s already sporting an Ashmont Market golf shirt as he supervises the new inventory deliveries from behind the front counter. There’s that— and the occasional “slip” or IOU that the brothers or their dad would write up for a regular or family that couldn’t quite pay their full bill each week. It happened more than a few times over the years. “You have to have the right merchandise to make a store like this work. You also have to have the right attitude,” says John. Somehow, as they’ve “grown old together” working here, as Harry says, the three brothers still like being with each other, even if they’ve tired a bit of the grind at the store: 12-hour days, 7-day weeks, and more. And never a vacation together. It just was time to sell, they all say, with varying degrees of certainty. Picturing Harry Georgoulopolous on the floor of a baklava factory in Huntsville, Alabama, doesn’t come easy for those who have supported his store. The looks of concern in his eyes and those of his brothers lay it out clearly: This day isn’t about the customers, or the store, or even their dad, rolling in his grave. They haven’t left yet. But they already miss the one thing that makes this their truly special place: each other.